A round up of all our smaller news for the month at Alternative Armies. This week we will put a free 28mm Elf Duellist (worth 2GBP) into all orders for 28mm miniatures. 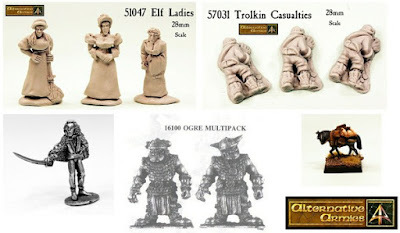 We have re-mastered and reduced prices on our pack of Elf Ladies and Trolkin Casualties. We have also re-molded two classic codes our 15mm Pack Mule and the Fantasy Warlord Ogre twin pack which are both reduced this week. We will end the week with our spooky new release which will be free in every order. But fret not! We are always fair and while you do not know what it is yet we will put it free into every order placed from now until the announcement; we are always fair. Thanks for your time.